How can I best view the Geminids meteor shower? If you live near a brightly lit city, drive away from the glow of city lights and toward the constellation from which the meteors will appear to radiate. For example, drive north to view the Geminids. Driving south may lead you to darker skies, but the glow will dominate the northern horizon, where Gemini rises. Perseid meteors will appear to "rain" into the atmosphere from the constellation Gemini, which rises in the southeast around 11 p.m. in mid-October. A far more modest, but still potentially enjoyable display of a few dozen Geminid meteors per hour is expected to favor North America. In the United States and Canada, eastern observers will be particularly well-positioned for maximum activity, expected sometime between 3:30 and 5:30 a.m., when the radiant of the Geminid shower will be well up in the dark southeastern sky. Waning Gibbous. Geminids shower gazing conditions will not be ideal. The moon will obstruct all but the brightest Geminids. History of Geminids coming soon! The Geminids meteor shower is the final major meteor shower of the year and also the most consistent shower in terms of putting on fruitful display. This annual meteor shower has been observed for over 500 years and is active from December 4th through December 17th (in 2015). The Geminids are distinguished by their multi-colored display. Observers below may be treated so several colors—65% white, 26% yellow, and the remaining 9%, green, blue, and red. Meteors streak through the night sky at a moderate speed, which makes them less difficult to miss when compared to faster meteors. The Geminids are extremely bright and are every so often capable of producing fireballs. While this annual spectacular appears to radiate from a constellation, they are actually caused by the Earth passing through the dust particles of the comet 3200 Phaethon. Each autumn, Earth passes into a trail of dust left by this comet, and as a result, all the dust and debris burning up in our atmosphere, travelling at a very fast 21.75 miles per second, produces the spectacle known as the Geminids meteor shower, or what are popularly recognized as "shooting stars". There's no danger to sky watchers, though. The fragile grains disintegrate long before they reach the ground. While the meteors are certainly bright, they are typically not much larger than a grain of sand. However, as they travel at immense speeds, these tiny particles put on an impressive show. In 2015, the Geminids are best viewed on the night of December 13th though the morning hours of December 14th. The Geminids are known for producing 100-150 meteors per hour at times, but this year may not surprise us with such a visually striking performance, since the shower will peak seven days after the Full Moon. This year, eager sky watchers who are fortunate enough to have completely clear skies may witness between 40 and 60 meteors per hour. (The time frame for the most intense activity is anticipated sometime around 5:45 UTC on December 14, 2015). As one can imagine, the less cloud cover, natural light from the moon, light pollution, and precipitation present, the greater the number of meteors you'll have the chance of viewing. Fortunately, the Waxing Crescent Moon (12% full) will coincide with the peak of the Geminids this year. This will greatly increase your chances of observing meteors streaking through the night sky. This year will be ideal for watching the Geminids. This is the final major meteor shower of the year, so those willing to stick it out in the cold (or warmth, for those in warmer environments) will be treated to a memorable showing--a great way to end 2015. How do I know if the sky is dark enough to see meteors? If you happen to live near a brightly lit city, if possible, we recommend that you drive away from the glow of city light. After you've escaped the glow of the city, find a dark, safe, and possibly isolated spot where oncoming vehicle headlights will not occasionally ruin your sensitive night vision. Look for state or city parks or other safe dark-sites. If you can see each star of the Little Dipper, your eyes have "dark adapted," and your chosen site is probably dark enough. For the best view, meteor gazers should face in any direction away from constellation Gemini and the moon, which will appear close to the constellation. This way you won't have the bright moon within your field of view. The constellation Gemini (The Twin) is the radiant of the Geminids meteor shower, which means that meteors appear to radiate from within the constellation. 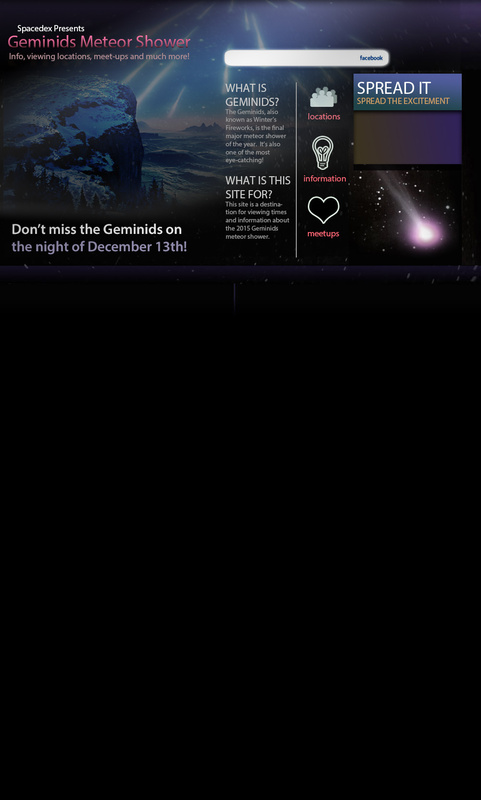 Correspondingly, the Geminids meteor shower is named after Gemini. From within Gemini, the Geminids meteors appear to originate from Gemini's bright stars, Castor and Pollux. For most meteor shower, observers would face the direction of the showers' radiant, but this is not the case with the 2015 Geminids. Unlike many of the other major meteor showers, the Geminids can be viewed early in the evening. This is due to the radiant (the constellation Gemini) being about 30 degrees above the eastern horizon by 9:00pm. Before you head out, remember to dress warmly and to get comfortable. Observing a meteor shower, especially one that occurs in less than ideal conditions, takes a lot of patience. However, those who stick it out may be treated to a great showing. We wish you a wonderful viewing experience, and hope that the last meteor shower display of 2015 packs in several surprises! Waxing Crescent Moon. Geminids meteor shower gazing conditions will be ideal. The moonlight will not wash away fainter Geminids meteors. Name origin: Appears to radiate from the constellation Gemini.